At high tide the water laps under the huge private deck, almost as large as the apartment itself, making you feel almost like you are on a boat when it's high tide. Jump in the water and swim or float away or just sit on the deck, listen to the sound of the water, watch sunrises and sunsets from the comfort of your seat. Even when you are inside the apartment the wall of glass sliders open up to make the outdoor space seem to merge with the indoor space. You can see the water from everywhere - the living room, the cute dining nook, the kitchen, the bedroom area, even standing in the large bathroom looking out while you are standing at the sink brushing your teeth. You'll also enjoy that extra time reading or lounging in bed since you can see right out through the sliders to the deck and the water! The interior is almost 600 square feet of open space, comfortably and creatively furnished with folk art pieces, the owners' own artwork and nice furniture including a comfortable L shaped couch and armchair. Sit back and enjoy the sun through the overhead skylight spanning the entire width of the living room and experience the warmth of the wide-plank pine flooring throughout or enjoy the large screen cable TV. There are curtains and electrically-powered shutters for extra privacy and room darkening and a fireplace to take the chill off in the shoulder seasons or for ambiance. The kitchen is gourmet-sized and well stocked, featuring a five-burner, stainless-steel stove and new custom tangerine Corian countertop. And yes, that is the original sign from Gallerani's Cafe, my old restaurant, that used to be just down the street. Eat or cook inside or outside on the gas grill, the choice is yours. The bathroom and shower are large, the latter even having a seat. There's a washer/drier for added convenience. Cozy, warm, inviting, and relaxing, right on the water. Near all the Provincetown activity, but at the same time away from it all. That is what your westend waterfront rental will offer you. SORRY, CREDIT CARDS NOT ACCEPTED. Hi - I'm a retired guy and lovin it. Used to own Gallerani's Cafe so many of you know me as the host with all the crazy outfits. Now I enjoy the luxury of watching the tide come and go, biking, reading, socializing, artwork, travelling, whatever. And with my boyfriend John. Fortunate indeed. I spend most of the year in Provincetown (upstairs from this rental), winter in my house on the Big Island of Hawaii, and the rest here and there. I always wanted to live in Ptown for its unique sense of spirit, geography and gay lifestyle and it was a goal to live on the waterfront. I've never looked back after 30+ years in the same place. On the water in Ptown is fabulous. It's never dull seeing the water at low or high tide and all the activity that goes with it from boating, swimming, etc. in the summer to the birds and weather all year round. Sitting inside and looking through the wall of glass or outside on the enormous deck/pier you have a real feel for being part of the wonderful environment that is right there. And there's a wonderful warmth to the way the property is situated between the two neighboring properties, one of which is the historic Capt. Jack's Wharf. No phone necessary since I assume most everyone has a cell phone and reception is excellent at the apt. Parking is provided a few blocks away from the apartment upon request during season. As you can see from the pictures, the living room is spacious and comfortable with an L shaped sofa and an extra chair. Perfect for reading, watching tv or just looking out the sliders to the water. I try to keep common spices, olive oil and vinegar, sugar, salt & pepper etc. on hand and start you with off with coffee and tea. Table inside and out so you can dine anywhere you like. Modern tv. Basic cable. Streaming on your own account. Bose ipod dock provided so you have your own entire music library with you! Beautiful dahlias and more in the summer surround the deck. We have stayed in the West End every summer for over 20 years, in multiple different units, always on the water. This was, by far, one of the best. The unit is much more roomy that it appears in the photos, it was actually comfortable to hang out inside all day on the day it rained. Good comfortable large couch that looks over the harbor with large slider windows. The deck is great. Very large, easily accommodating a round umbrella table and two deck chairs with ample additional room. Big plus was the generous containers lining the entire deck with beautiful flowers (these were tall flowers and I am still impressed with how they were all upright despite the frequent breeze coming in from the harbor). For people who have stayed i the West End and know what they are looking for, this place really is ideal. Very clean. Simple, yet very comfortable. Interesting layout and interior design. Elements of the old building with all the new comforts. Barry was super easy to deal with. We will definitely be back. If you haven't stayed in the West End, look elsewhere for the countless descriptions of how this is a magical location to stay. This place is fantastic! It's a roomy cottage with beautiful renovated kitchen and bath in the quiet west end. But the best part is the giant deck that overlooks the bay with steps leading down to the beach! We watched the moon come up over the bay each night and took our dog down to the beach at low tide every day, right off of the deck. Plus Barry the owner is awesome! Highly recommend this property--we're so lucky we found it! Convenient to town, comfortable and relaxing. We were fortunate enough to utilize Barry's wonderful condo for a girl's weekend. Barry is so easy to deal with and the property was exactly as described. We spent most of the weekend on the incredible deck overlooking the ocean...sipping cocktails of course. We also highly recommend the Raw Bar happy hour at the Red Inn, only a short walk west of the property. We took the ferry in from Boston and did not need a car for anything, as the property was so centrally located. Thank you Barry for sharing your home, and we will be looking forward to next year! This is a fantastic place! 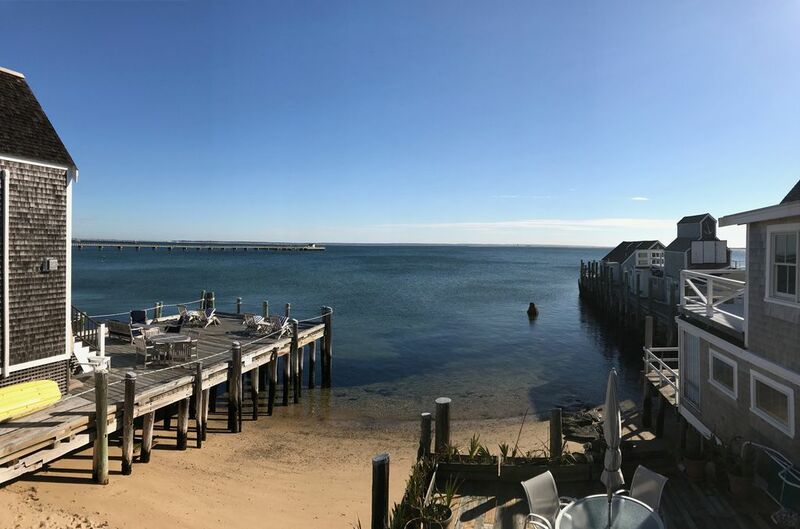 Anyone who visits Provincetown knows that really good accommodations can sometimes be a challenge to find, especially during the summer months, but no disappointment here. Perfect location, comfortable bed, great kitchen (our favorite part), and the deck...amazing! Thank you Barry for sharing your great space! We will definitely be back. Loved our stay here. Our favorite feature of the condo was the spectacular view from the panoramic wall of floor to ceiling windows overlooking the deck/bay. Perfect for unbeatable sunrise views. The pictures don’t do the view justice. The location in the west end was fantastic as well – quiet, residential area that is instantly relaxing but just a quick, easy walk to town. One day we walked the other direction instead and discovered the Red Inn – our new favorite spot for happy hour oysters! Since you are right on the water start off with swimming, canoeing, kayaking, boating of all sorts (rental is not far away). Relish, famous for its baked goods and sandwiches is just down the street. Sals, Victors, the Red Inn, Joon Bar, all good restaurants, are minutes away. You are in the historic West End of town so just walking the street and looking the neighborhood is great. Across the street is the oldest house in Provincetown. Next door is Capt. Jack's Wharf. Bike the fabulous bike trails and out to Herring Cove beach or Beach Forest or Race Point. It's a short walk to the breakwater, Long Point Lighthouse and the Moors, Downtown and all the funky shops and restaurants that make Provincetown unique are a short walk in the other direction. You won't lack for entertainment day or night. Having travelled the world over I think Provincetown is one of the most interesting people watching, shopping, biking places I've been. Rates - $1400-3000 depending on season time security deposit of $350 higher rates on holidays $20/night pet fee Saturday to Saturday during high season SORRY, CREDIT CARDS NOT ACCEPTED. No cancellation allowed.